This time, coupled with my Mountie jacket, my vintage men’s plaid shirt feels much more polished. My jeans? They’re Mynk. And yet again, I’ve matched my nail polish to my jacket. And yet again, I did not mean to. I suppose it means I’m drawn to vibrant colours. They’re like a ray of sunshine on a rainy fall day. ooh can’t wait to check out the boots (if you so happen to wear them again soon) and..can’t wait to check out your costume pics! so cute! and i loovveee your shoes! I love the red jacket and the way you roll up the sleeves to match the jacket! Love the plaid paired with that fabulous jacket! I love the red nailpolish with these shoes! but in wich season are you there? looks like very sunny! You can’t go wrong with plaid. I do like this more polished look as well… that blazer is a great touch. Your outfits make me want to go shopping. 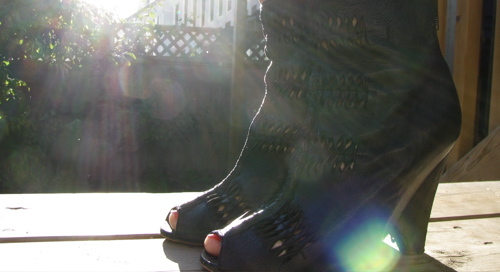 where are your amazing boots from? i love them.oh those details are perfect. Love the plaid and red, gorgeous pairing, love! Fabulous look, darling! Love your shoes! I like the little red jacket. Janet — They’re Sam Edelman. SofiaSophie — It’s rare, but sometimes we’re lucky enough to have a sunny fall day in Vancouver. Hauteworld — Your suede over the knee boots will be so gorgeous. And it gives me comfor that you’re wearing them to work. But you do work in Paris. And alas, I do not. Melissa — Haha! I’m happy to hear that. Niki — Bright colours cure grey days, don’t you think? Denise — Mountie pants? Even awesomer. Mina — I found them at Macy’s a little while ago. Miss Neira — Thank you! Jess — I’m so happy to hear you’ve subscribed to the Anthology’s RSS feed! Becky, Couture Carrie, RunawayGallery — You guys are so sweet — thank you! I love bright colours toooo!!! I am wearing a bright bright green tank today with bright purple shoes, case in point. Do you think it’s genetic? Great look and i love the brightness of the red jacket. Ah, I love that plaid shirt! I’m FINALLY getting a plaid shirt from Burton that I’ve been waiting for, for a loooong time :) Sadly the fit is a little loose but it’s going to be great for winter.